Make that jump shot, sprint towards the goal, and shoot stronger by working on improving your explosive power. But let’s get a few things straight first, okay? Explosive power doesn’t just mean that you can throw a ball against the wall hard (looking at you, wall balls!) Explosive power is your ability to exert maximum force and velocity (speed). Properly defined, explosive power is a triple-extension movement—that means it involves the flexing of your ankles, knees, and hips. 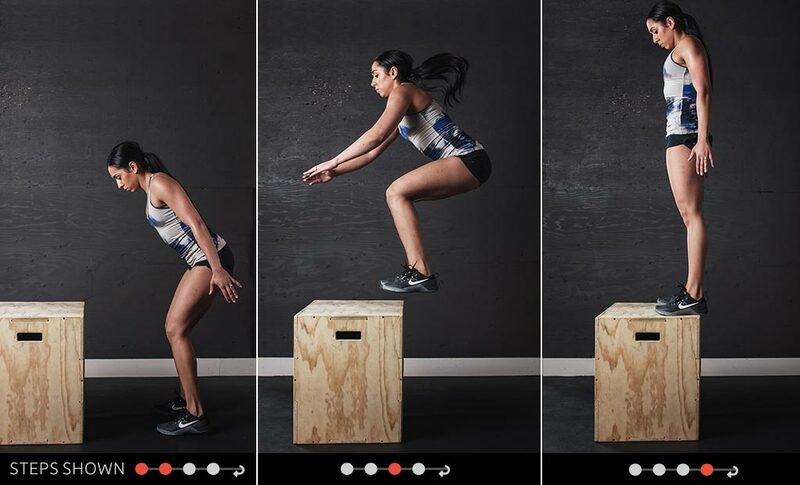 Box jumps require two explosive movements: jumping onto the box (eccentric) and jumping off of the box (concentric). The only equipment you’ll need is a steady, firm platform to jump on and off of. 1. Start with a box about knee-height and work your way to taller boxes. Stand close enough to the box that you can use your energy for height, not for distance, but not too close that you will clip your feet and get injured. Squat down slightly with both feet under your shoulders. Jump onto the box with both feet at once. Once you have a solid base, but as quickly as possible, jump backwards off the box with both feet, landing with a slight bend in the knees. Your arms will natural swing back and forth with your movement. With ball slams, it’s not just about how hard you throw the ball—it’s your form, core engagement and the power you create while throwing the ball. Stand with your feet shoulder-width apart, knees slightly bent. Hold a weighted medicine ball over your head, with arms fully extended. Throw the ball down to the ground in between your feet with as much force as possible, contracting your abs, extending your ankles, knees and hips. Try to keep your chest as vertical as possible—this is a squatting motion, not a bending motion. Lift the ball, bring your body back to starting position and repeat. 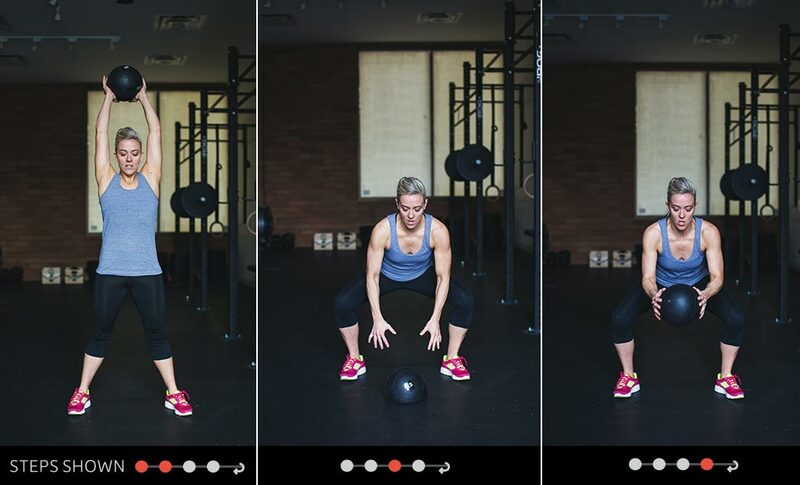 Repeat 5 to 10 times (the heavier the weighted medicine ball, the lower the number of reps). Once you can jump higher, what will you reach for? Joe Scali grew up playing hockey and continued to play College Hockey at Cornell University and went on to play professionally in Texas. With his elite background in competitive sports and his passion for training, Joe pursued a career in the fitness industry. Becoming a personal trainer, he enjoyed helping people change their lives through fitness. His passion for training and vast experience in the fitness industry led Joe to open Semiahmoo Athletic Club. Joe is a CFP Certified Personal Trainer, CrossFit Level 1 Trainer, TRX Certified Trainer, and Certified in Trigger Point Performance Therapy and Twist Conditioning. Inspired by her entrepreneurial parents, Sharan Dhaliwal pursued a degree in business and entrepreneurship. Upon graduating, she pursued a career in the Natural Supplements Industry and continued her studies by obtaining her Advanced Sports & Nutritional Advisor Certification. Sharan is a CrossFit Level 1 Trainer. Joe Scali is a freelance writer and regular contributor to Vega’s Expert Panel. Owner and Certified Trainer at Semiahmoo Athletic Club Joe Scali grew up playing hockey and continued to play College Hockey at Cornell University and went on to play professionally in Texas. With his elite background in competitive sports and his passion for training, Joe pursued a career in the fitness industry. Becoming a personal trainer, he enjoyed helping people change their lives through fitness. His passion for training and vast experience in the fitness industry led Joe to open Semiahmoo Athletic Club. Joe is a CFP Certified Personal Trainer, CrossFit Level 1 Trainer, TRX Certified Trainer, and Certified in Trigger Point Performance Therapy and Twist Conditioning.